A loan of $350 helped a member to buy a heifer to increase milk production and increase her income to pay her children's school fees. The lady raising her hand in the photo is Magdalene. She is 40 years old and a single mother of two children. She is a member of the Mwicariria Self Help Group, which joined Hand in Hand Eastern Africa to benefit from enterprise development and financial management trainings. She is a dairy farmer. 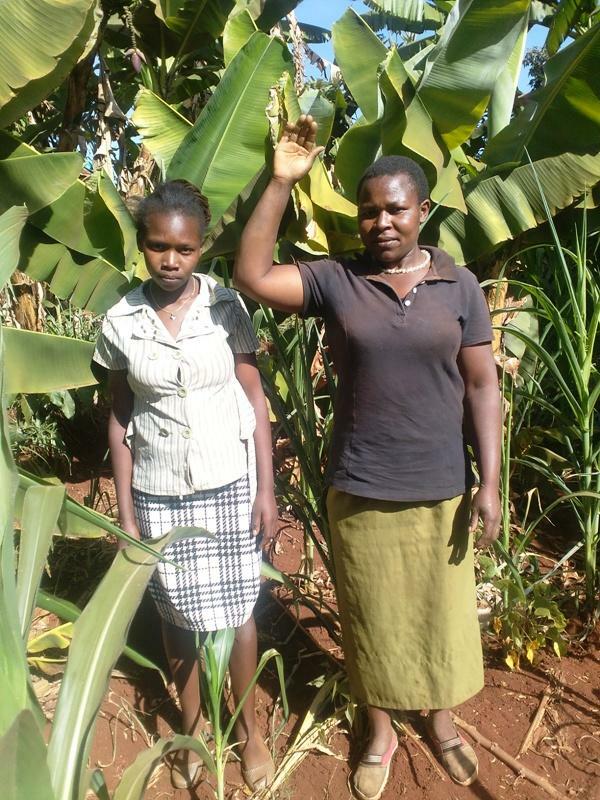 She is borrowing a Kiva loan to buy a heifer, which she hopes will increase milk production thus increasing her income. She will use the anticipated income to pay her children's school fees. She is grateful to Kiva and their lenders for the financial support and promises to repay promptly. It provides startup loans to risky businesses and underserved people. This loan is designed by HIH EA to reach a risky segment of society that is not currently being served by other financial service providers in Kenya. Borrowers in this segment do not have any income generating activities and often lack collateral to be eligible for working capital loans. Additionally, they live in areas where access to microfinance is limited. By funding this loan, you are providing people with financial services they otherwise would not have access to. Hand in Hand Eastern Africa is a non-governmental organization operating in Kenya that works to alleviate poverty through social mobilization as a means for job creation, business training, value addition, market linkage support and access to microfinance services. Since it was founded in 2010, the organization has specifically focused on the marginalized poor, mainly women and youth, who earn below $2 USD per day. In addition to providing loans, it also offers a structured enterprise development and loan management-training program. Kiva shares Hand in Hand EA’s mission of alleviating poverty through income generation. About 75-80% of Kenya’s population lives in rural areas, and in 2011, the UNDP Human Development Report ranked Kenya among the lowest of the “low human development” countries of the world. The organization hopes to provide vulnerable individuals, specifically women and youth, living on less than $2 USD/ day with training, opportunities, and hope. As of 2013, HiH EA had mobilized a total of 38,000 members, created 29,000 enterprises and facilitated 38,000 jobs.